We sell small, simple, circuitboards and kits. Have a browse through our products, to see if you like anything. Don't forget to have a look at our Read Me section for various articles, tutorials and information pages. If you've got any questions, please contact us! Following a flurry of stencilling, soldering, programming and testing, the TellyMate Shields are back in stock. OK. You've wiped out our TellyMate Shield stock! More PCBs and components are on their way. We should have stock again in a few weeks. 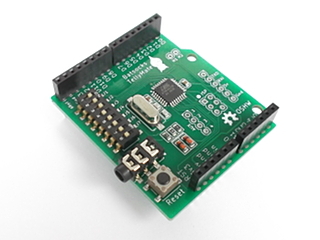 TellyMate Shields are back in stock - with a new board-spin, and now feature the ATMega328 chip. This gives you all the character-based TV output that you had with the earlier boards, but you also get 64 SRAM user-defined characters to play with, and up to 11 fontbanks in Flash! The TellyMate Tiny is back in stock - now using the ATMega328 chip, meaning there's 11 fontbanks and 64 user-defined characters to play with!